(CNN) - John McCain and his aides are still banking on a come-from-behind victory Tuesday, but the GOP's most famous political strategist is forecasting Obama is well positioned to win. Karl Rove, the man widely credited with engineering President Bush's two successful White House bids, is out with a new map showing the Illinois senator will take the White House in an Electoral College landslide, winning 338 votes to John McCain's 200. That would be the largest Electoral College victory since 1996, when Bill Clinton defeated Bob Dole in a 379-159 rout. 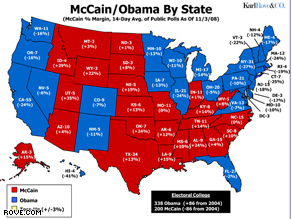 In an Electoral Map posted on Rove's Web site, the Republican mastermind shows Obama victories in several key battlegrounds, including virtually all of the states where polls suggest he currently enjoys a slim advantage. In fact, Rove believes Missouri is the only crucial battleground state McCain will carry, while Obama scores victories in Florida, Ohio, Pennsylvania, Colorado, New Mexico, Minnesota, and Iowa. Rove also thinks Obama will win traditionally-Republican Virginia. UPDATE: Rove has not made any definitive declarations, and writes some tight states - including Florida - could flip given some polling suggests movement in McCain's direction. Figure it's a landslide, but at no point should you not vote thinking you're candidate has it. Voting is your right and your duty to yourself, your country and the next generation. Do not take it for granted. This is so he looks innocent when Ohio and Florida go red by 1% even though there's record turnout of democrats and african americans. This is a new movement. Go vote and be a part of it. Don't think it will be done by somebody else. No matter what happens, you will still think you were a part of it. If you don't vote, you are not a part of it. This kind of movement happens once in lifetime. Don't miss your moment, your share. I just voted for the only change agent, the guy with wisdom and knowledge to restore confidence to all American people. I just voted for Obama in Arizona and it's the most excited I've been for an election; hope is in the air and I think many can aready feel it! Go Obama!!!!!!!!!!!!!! Let's turn Arizona blue!!!!!!!!!!! Such an honor to be involved in this historic event. Although I am always proud to be an American, my heart threatens to explode on this Election Day as I watch the country unite in a common purpose. Whether voting for McCain or Obama (my choice for change), the sheer numbers of voters legitimizes the blood, sweat, and tears shed by countless minority and women activists in decades past. GET OUT AND VOTE!!!! A Prediction is a prediction, not a fact or reality no matter who makes the prediction! It's up to you to make the world know that America has always been about HOPE! Do not listen to persons that may have underlying motives. People should not call the race early. Rove is wanting attention. He makes his money from the crap he speaks. Vote. By the way..... Go Obama! I took my 6 year old son to the polls with me this morning so he could see the voting experience first hand. I let him help me push the button to make my (our) vote final! I had to fight back tears when I put his "I Voted" sticker on his shirt. I don't think he fully understands the process at 6, but I'm hoping I left a life long impression on him.... Voting is important and a Priveledge! The line for free cheese starts here.. Which sensible American, who wants only the best for his family will Vote for McSane and Petty Palin. Come on guys/gals, wake up and smell the destruction the Republicans caused in the past 8 years. Some might say 6 but hey, GO OBAMA GO!!!! YOUNG PEOPLE – go VOTE! YOu have to!! I voted for Obama. But I'm scared when Rove is making statements like this..... I don't want Rove making any statements positive towards Obama – he's just bad news! If Rove said it – then something's fishy. He probably said it to help motivate Republicans to get out and vote. Maybe now Rudy Giuliani knows what an Organizer is. Let's all write to our Congress members to have Election Day declared a national holiday in the future. We need to eliminate every obstacle to voting that we can. People should not have to take a day off work and possibly lose pay because they want to vote. Here in Atlanta, there is no public school on election day so parents have to take their kids to the polling place or try to find a sitter. Spread the word and let's start a movement to have a National Holiday on the first Tuesday in November every four years! I voted for "That one" because "the other" one does not have respect for the people in this country what tells me he will not care about us at the end. He needs to show respect to others and listen to people more. I never thought I would see the day...not in my lifetime. I hope it is a real landslide for Obama/Biden. I am proud of my country! Pat-you can hang it up. I hope Obama wins, all the eyes of the world are on this one. Most of us internationals fear what McCain will bring or continue.